Rowman & Littlefield Publishers, 9781493025770, 288pp. At the dawn of the twentieth century, Theodore Roosevelt and J. Pierpont Morgan were the two most powerful men in America, perhaps the world. As the nation's preeminent financier, Morgan presided over an elemental shift in American business, away from family-owned companies and toward modern corporations of unparalleled size and influence. As president, Theodore Roosevelt expanded the power of that office to an unprecedented degree, seeking to rein in those corporations and to rebalance their interests with those of workers, consumers, and society at large. Overpowering figures and titanic personalities, Roosevelt and Morgan could easily have become sworn enemies. And when they have been considered together (never before at book length), they have generally been portrayed as battling colossi, the great trust builder versus the original trustbuster. But their long association was far more complex than that, and even mutually beneficial. Despite their many differences in temperament and philosophy, Roosevelt and Morgan had much in common--social class, an unstinting Victorian moralism, a drive for power, a need for order, and a genuine (though not purely altruistic) concern for the welfare of the nation. Working this common ground, the premier progressive and the quintessential capitalist were able to accomplish what neither could have achieved alone--including, more than once, averting national disaster. In the process they also changed forever the way that government and business worked together. 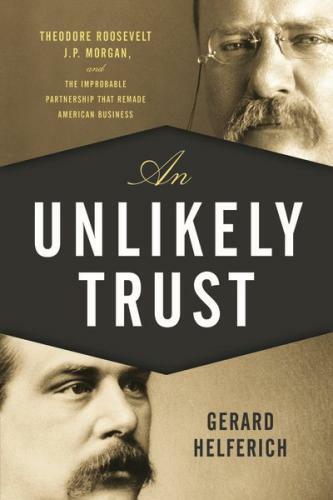 An Unlikely Trust is the story of the uneasy but fruitful collaboration between Theodore Roosevelt and Pierpont Morgan. It is also the story of how government and business evolved from a relationship of laissez-faire to the active regulation that we know today. And it is an account of how, despite all that has changed in America over the past century, so much remains the same, including the growing divide between rich and poor; the tangled bonds uniting politicians and business leaders; and the pervasive feeling that government is working for the special interests rather than for the people. Not least of all, it is the story of how citizens with vastly disparate outlooks and interests managed to come together for the good of their common country. Gerard Helferich is a regular book reviewer for the Wall Street Journal and the author of four highly praised histories: Theodore Roosevelt and the Assassin: Madness, Vengeance, and the Campaign of 1912, which was a New York Times e-book bestseller; Stone of Kings: In Search of the Lost Jade of the Maya, which was selected by the American Booksellers Association as an Indie Next title; High Cotton: Four Seasons in the Mississippi Delta, which was a Book Sense Notable Title and winner of the Authors Award for Nonfiction from the Mississippi Library Association; and Humboldt's Cosmos: Alexander von Humboldt and the Latin American Journey That Changed the Way We See the World, which was a Discover magazine Science Bestseller. He lives with his wife, the writer Teresa Nicholas, in Jackson, Mississippi, and San Miguel de Allende, Mexico. For more information, see http: //www.gerardhelferich.com.